As a member of Hawai’i Pacific University’s alumni, you will enjoy a vast array of benefits unique to our community. Please continue reading below to explore all of the benefits of being part of the HPU alumni ‘ohana. Are you looking to book an event in the downtown Honolulu area? Look no further than Aloha Tower Marketplace. Located on historic Honolulu Harbor at the edge of downtown Honolulu, Aloha Tower Marketplace’s panoramic views of the Pacific Ocean serve as the ideal backdrop for your next business meeting or social function. Aloha Tower Marketplace is Honolulu’s newest community gathering space – an anchor for downtown Honolulu and serving as a vibrant destination for a dynamic intellectual and cultural scene. Click here to learn more! To view the request form, please click here. Geico has made the GEICO Preferred Program available to Hawai'i Pacific University! HPU alumni may be eligible for a discount off your auto insurance with GEICO. HPU receives a fee for each quote requested. Click here for a free online rate quote. 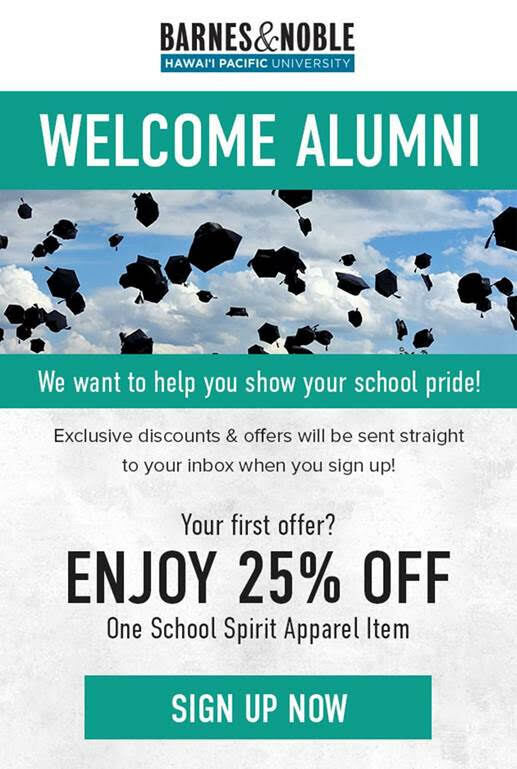 Be sure to mention that you are a Hawai'i Pacific University member. If you currently have a GEICO policy, identify yourself as a Hawai'i Pacific University member and see if you can save even more! Aloha Pacific Federal Credit Union, the official credit union of HPU, has put together a special promotion for HPU alumni. Have you ever considered joining a credit union? These not-for-profit financial institutions exist to serve their members. By signing up to be a new member, you will receive all the same services of a traditional bank with the added benefits of up to a $75 bonus (upon completion of certain requirements), a complimentary one-time membership to the Honolulu Zoo and discounted movie tickets, among other things. Please see all the details below. You may sign up at any of their branches on ‘Oahu and on the 9th island of Las Vegas. Plus, earn an additional $50 Bonus(1) when you enroll in a monthly recurring direct deposit. Added Bonus – Ask us about a one-time complimentary 1-year Honolulu Zoo Membership ($55 value) which allows unlimited admission for one year for you plus one additional adult and up to four children. Valid for new Honolulu Zoo members only. Or visit a nearby Aloha Pacific FCU branch for more details. (1) Offer valid 1/1/19 for Hawai’i Pacific University Alumni only and may be modified or canceled at any time. Membership is subject to eligibility verification. Limit of one $25 and one $50 bonus per new member; subject to 1099-INT reporting. First direct deposit must be received within 60 days of opening the KalaRewards account. Qualifying direct deposit is a $250 or more recurring direct payroll or retirement deposit consisting of an electronic deposit of wages, retirement or Social Security income, and must be maintained for at least 90 days. $50 bonus will be paid to the savings account within 90 days after completing requirements. An account closing fee will be assessed and any bonuses earned must be paid back if the savings account or KalaRewards account is closed within six months after enrollment. Other restrictions may apply. See branch for details. (2) The first five (5) withdrawals per month at non-APFCU ATMs are free; thereafter, there is a $1 fee per withdrawal. See branch for details on applicable fees and terms of our surcharge-free ATM access. (3) Personal term loan offer valid as of 1/1/19 and may be modified or canceled at any time. 2.49% is the lowest rate for the 12 month term. Valid for loan amounts from $1,500 to $30,000. See branch for details on applicable fees, and terms, up to 72 months. Example: monthly payments on a $2,500 loan could be as low as $211.36 for 12 months. Your loan approval and APR are based on credit-worthiness. Offer includes a 0.24% discount for automatic payment from an APFCU account, or an account of its divisions. New loans only. No refinancing of existing APFCU loans, or loans of its divisions. Other restrictions and terms may apply. (4) APR includes a 0.24% discount off regular rate with automatic payment from an APFCU account, or an account of its divisions. Rates and terms may vary based on vehicle age and creditworthiness. (5) Rates effective 12/20/18 and subject to change. Program may be modified or canceled at any time. Membership ($5 in Regular Savings) required. Subject to credit approval. HELOC offer is a promotional rate of 0.50% APR for 12 months. After your initial period, the APR is variable and subject to change, based on the Prime Rate published in the Wall Street Journal, with no added margin, and adjusted quarterly (3.75% minimum & 18.00% maximum). Program is a 10-year draw with interest-only payments and 20-year amortization period. Maximum line: $250,000. Applies to owner-occupied properties with required homeowner’s and hurricane insurance; flood insurance required if property is located in flood zone. Maximum loan-to-value of 80% in Hawaii; maximum loan-to-value of 70% in Nevada. Estimated 3rd party fees (ALTA policy, appraisal, trust review & attorney, etc.) for a $250,000 HELOC are $250 to $3,800. APFCU offers up to $500 closing credits against all 3rd party fees with an initial draw of $10,000 or more at closing; all closing credits paid by APFCU must be reimbursed if the loan is closed before 36 months from the opening date. Some restrictions may apply. See branch for details on applicable fees, and for other available rates and terms. (6) 2.40% Annual Percentage Yield (APY) Certificate offer valid from 1/1/19 and can be modified or canceled at any time. Must be opened at an APFCU or a Division of APFCU branch. Limit: one Certificate per primary member of APFCU or a Division of APFCU. Membership ($5 in regular savings), new Checking account opened on or after 9/1/18 with minimum balance of $100 and direct deposit required. Without a new Checking account and direct deposit, 2.20% APY Certificate will be offered. Must be new funds, deposited from a financial institution other than APFCU or a Division of APFCU. $1,000 minimum and penalty for early withdrawal. Other restrictions may apply. Check out HPU alumni travel discounts through YTB Travel Network. Alumni are entitled to access their my.hpu.edu email address for life. Should you ever need support regarding your email address, please email help@hpu.edu. Alumni who attended HPU after 1998 used Campus Pipeline (student portal). Pipeline allows users to do a multitude of things including accessing their unofficial transcript. Logging into Pipeline requires your student ID number and password. For those who need to regain access to their Pipeline account, use the “forgot username and password” link on the main login page of Pipeline. Any login issues can be reported to HPU ITS by emailing help@hpu.edu. Your access to the wonderful staff of and services provided by the HPU Career Development Center doesn’t end at graduation. Below are some of the benefits offered to alumni. Only alumni who used Campus Pipeline (student portal) while attending HPU can access their unofficial transcript information via the quick link once logged in. Please note, there is no unofficial transcript to be requested, you would simply screenshot the information while in Pipeline. Logging into Pipeline requires your Student ID number and PIN. For those who need to regain access to their Pipeline account, use the “forgot username and password” link on the main login page of Pipeline. Any login issues can be reported to HPU IT by emailing help@hpu.edu. Unofficial transcripts are not available to former students or alumni who attended HPU pre-Pipeline. If you attended Pre-Pipeline, your only option is to request an official transcript via Parchment. Directions for ordering paper or electronic official transcripts can be found here. Recent graduates can expect their diplomas to arrive at the addresses provided on their PTGs around (3) months after their commencement ceremony. If you need official documentation of your degree conferral before then, HPU can provide an official letter, or you can order an official transcript through your Pipeline account. With any diploma questions, please email ptg@hpu.edu. For details about other the post-graduation services provided by the Registrar’s Office, please visit hpu.edu/registrar. 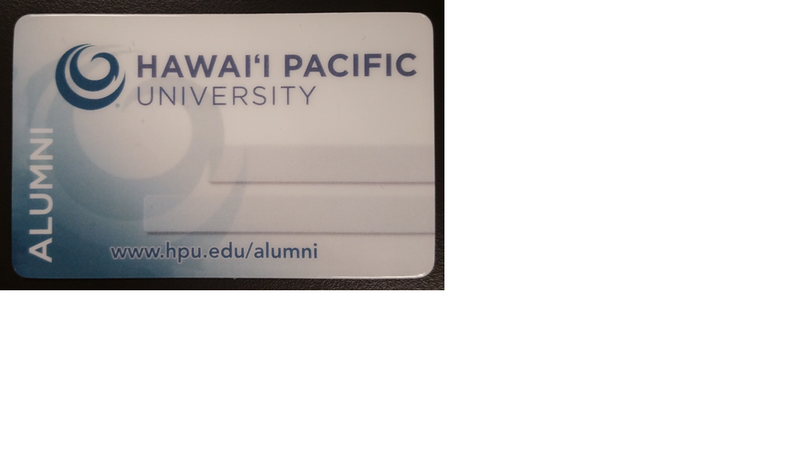 With an HPU Alumni Card and picture ID, HPU Alumni may access the HPU Libraries’ locations at Meader Library, Aloha Tower Learning Commons, and Atherton Library. To borrow circulating books from HPU Libraries, you will need to register for membership, using the form located here. Please email circulation@hpu.edu if you have any questions. • An HPU Alumni Card (shown below) can be obtained by emailing alumni@hpu.edu. The alumni should email their full name, HPU ID#, and current mailing address in order to have a new card mailed to them. • Alumni may borrow up to 10 books from the HPU libraries’ circulating collections at a time, showing an HPU Alumni card and picture ID each time they borrow from the library. • Loan periods vary, and overdue materials are subject to fines. Please see the Circulating Materials Policy for details. • Alumni may access electronic library resources using HPU iMacs on campus. • Alumni need to renew membership with the HPU Libraries every year to maintain borrowing privileges. This enables us to keep our records current. Membership is free of charge. Please submit the Membership Form below to renew your membership. • All library patrons are expected to follow the University Libraries Conduct Policy. Please click here to fill out an Alumni Library Access Form.